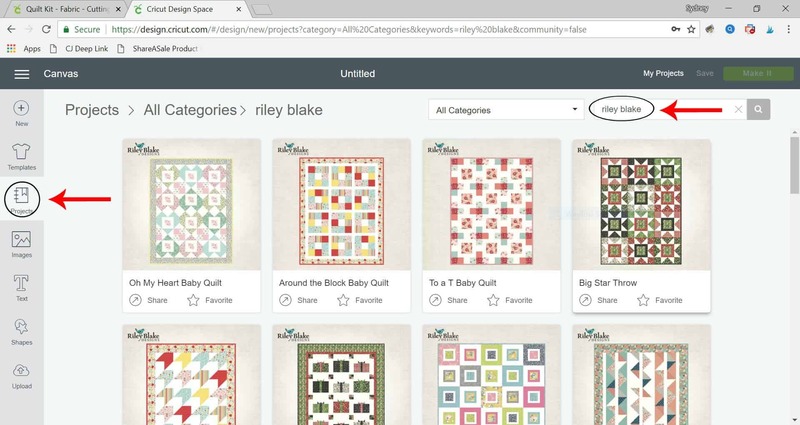 Check out all the pretty fabrics and fun pattern options available from Riley Blake and see how easy it is to make a quilt with your Cricut Maker. I’m super excited to share today’s post! 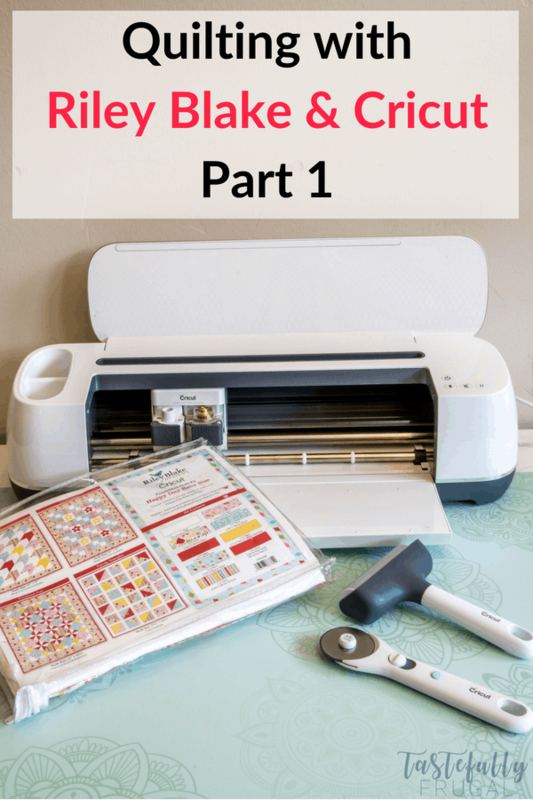 It’s actually the first post in a 3 part series where I’ll be sharing everything you need to know about making a quilt with your Cricut Maker. I’m so excited about this because making a quilt has been on my bucket list for YEARS! But with no real sewing appearance and little to no time to cut all those pieces I figured it was something I could do when my kids got older. But now that dream is becoming a reality thanks to Riley Blake fabrics and the Cricut Maker. This post I will talk all about the different options available for fabrics, designs, etc. and what supplies you’ll need/want to make putting your quilt together easier. Next week I’ll be sharing tips and a tutorial on cutting out the different pieces for your quilt and the last post will be a full tutorial on piecing together your quilt! This has been such a fun process and I can’t wait to share with you everything I’ve learned! Let’s get started! When you order your quilt kits, you can use code TFRGUAL to save 10% and get FREE shipping! This code works for everything on Cricut.com (except Maker machines and EasyPress). I ordered both the Ava Rose Throw Size (which is sold out 🙁 ) and the Happy Day Baby Size which is what I’ll be showing you in these posts. 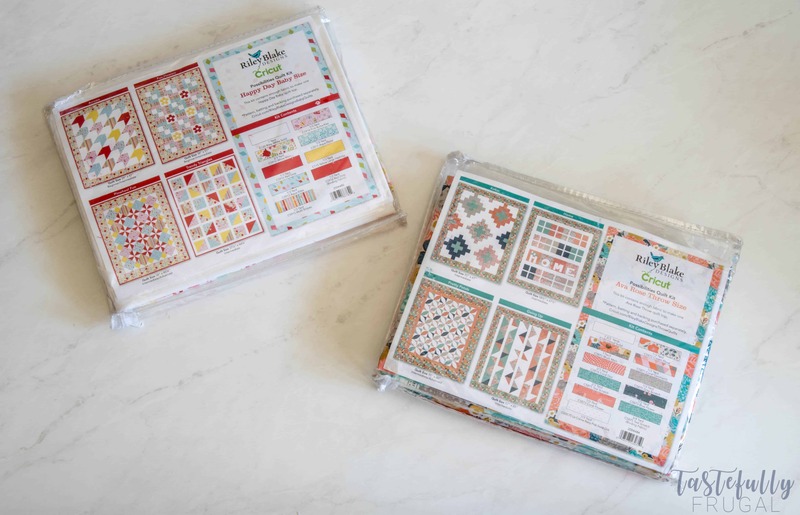 On the quilt kits there are four suggested patterns available with different skill levels but there are SO many more options available in Design Space! 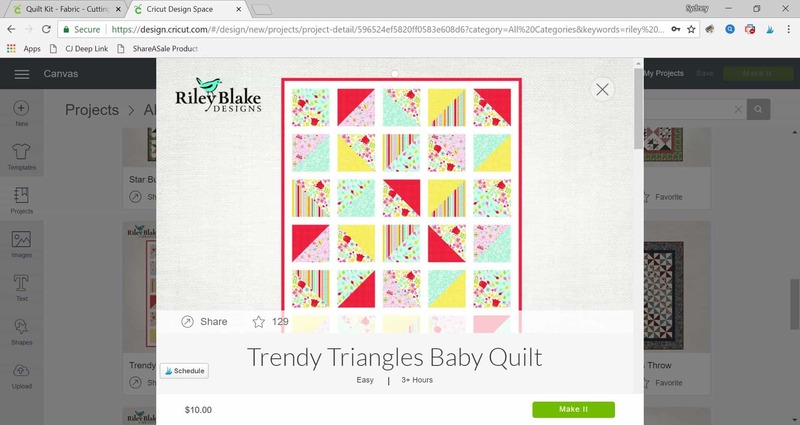 When you scroll down to the bottom you can find the PDF directions of how to put together your quilt. I like to save this to my computer AND print them, just in case I’m working on piecing things together and I’m not at my computer (which is usually what happens). I decided on the Trendy Triangles Baby Quilt because I felt like it would be the easiest for me as a first time quilter. So the hard choices have been made, fabric and pattern, let’s talk about how to make creating your quilt easier. I made a list of all the supplies I used and why you need them and/or how they make prepping your fabric easier. Self Healing Mat – Cricut makes several self healing mats, including super pretty double sided designer self healing mats, and these are not only great for keeping your work surfaces protected but they also making trimming your fabric down to size (so they fit on your cutting mat) really easy. 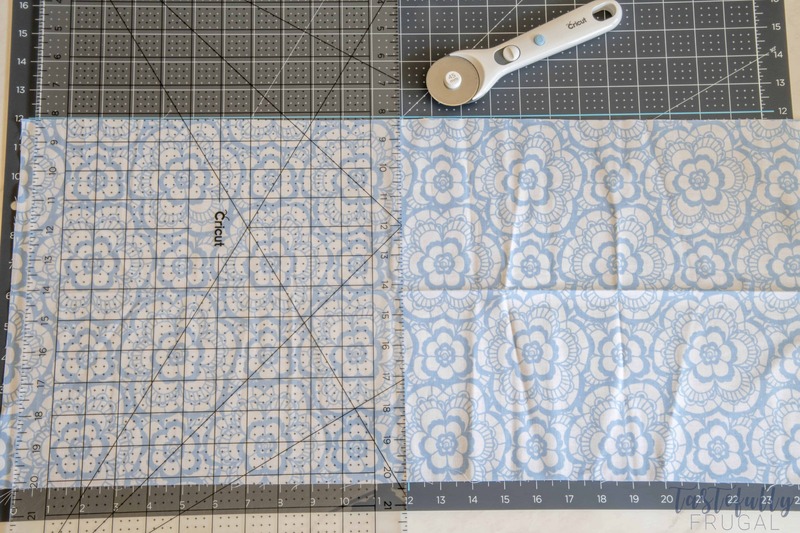 They have rulers on both sides and blue lines on the 12″ and 24″ marks so you can easily cut your fabric down to size. Rotary Cutter – Having a rotary cutter is a must for trimming your fabric down to size. I have used other brands, and personally I like the Cricut Rotary Cutter the best. Cricut Brayer – This little tool is a life saver! It smooths out your fabric once it’s on the mat and makes it so your fabric gets cut evenly. 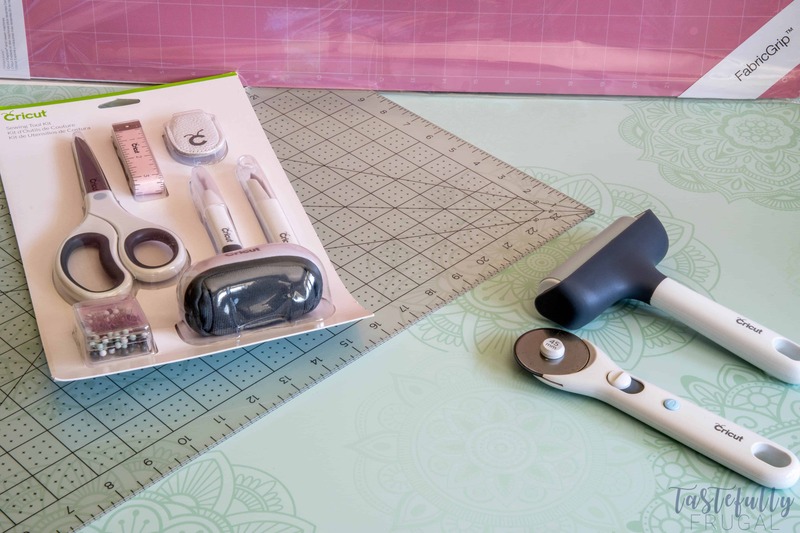 Cricut Sewing Kit – This kit comes with lots of helpful tools for sewing including: Fabric Shears, Thread Snips, Seam Ripper, Pin Cushion and Pins, Measuring Tape and Leather Thimble. And there you have it. 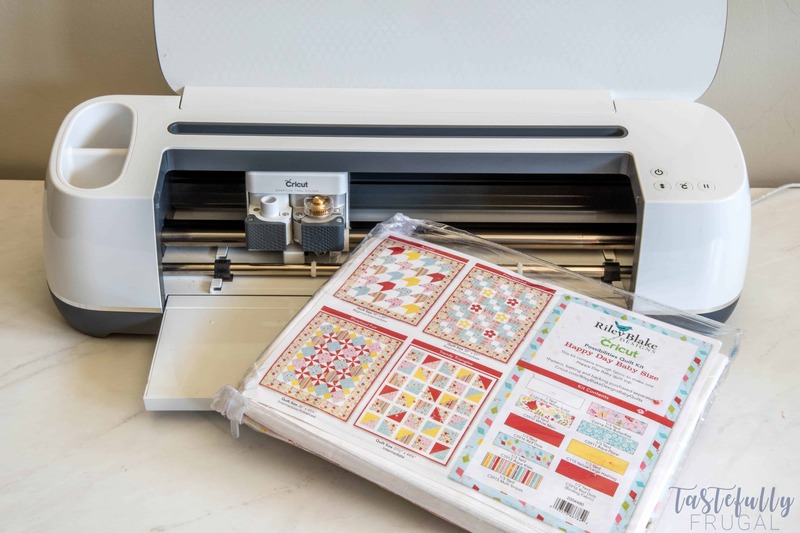 Everything you need to know about the fabrics, patterns and supplies you need to create a quilt with Cricut and Riley Blake! I’ll be back next Wednesday sharing tips for cutting your fabric with your Cricut Maker. If you want to craft along with me, order your supplies this week and join me for a Facebook Live on my page, Tastefully Frugal next Wednesday as I cut some of the squares and share tips and tricks live.